Wayne Kawamoto. The Spruce Crafts, 2011. Here’s a balloon animal that you can make in the shape of a horse. As you may suspect, the balloon animal horse is a variation on the balloon animal dog. As a result, I recommend that you first learn how to make the balloon animal dog before tackling the horse. 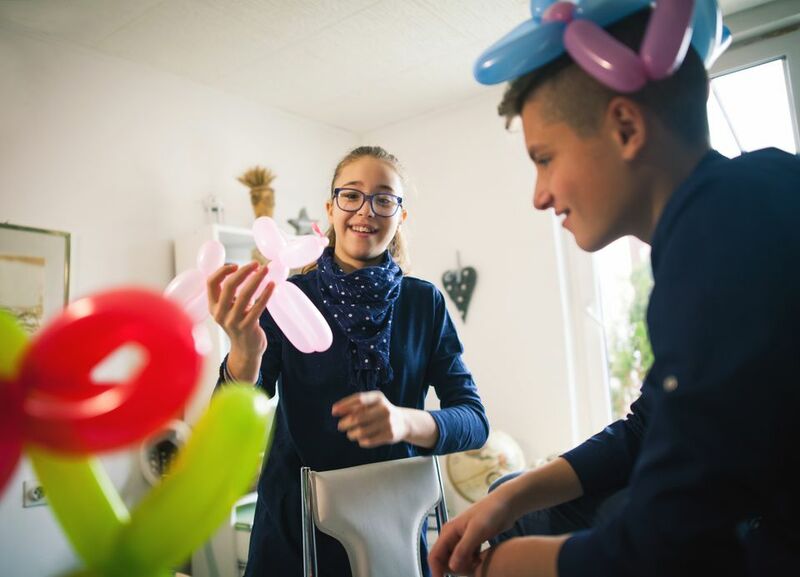 Among balloon animals, this relatively straightforward balloon animal is great for beginners and novices, and kids will love it. Make one basic balloon twist about three inches long. This will form the nose of the balloon animal horse. Make one small pinch twist. This forms the first ear of the balloon animal horse. Make another small pinch twist. This forms the second ear of the balloon animal horse. Try to make sure that the second pinch twist is approximately the same size as the first. Your balloon animal should now resemble the head of a horse. Make one basic balloon twist about two inches long. This will form the neck of the balloon animal horse. From this point on, the construction of the balloon animal horse is identical to that of the balloon animal dog, but with different proportions for the body and legs. Make one basic balloon twist about three inches long. This will form the first front leg of the balloon animal horse. Make a second basic balloon twist about three inches long. This will form the second front leg of the balloon animal horse. Make a lock twist to form the neck and front legs of the balloon animal horse. Make one basic balloon twist about three inches long. This will form the body of the balloon animal horse. Make one basic balloon twist about three inches long. This will form the first back leg of the balloon animal horse. Make a second basic balloon twist about three inches long. This will form the second back leg of the balloon animal horse. Make a lock twist to form the front legs of the balloon animal horse. The remaining balloon becomes the tail for the balloon animal horse. You have successfully created a balloon animal horse.